Hard-hitting Philly blues/funk band, bringing you nothing but groovin', feel-good music. 1. When the Sun comes Up starts off like a lost Springsteen classic but in Viscounte’s hands, quickly develops into an Alt-Country meets the ‘50’s groove. His voice has a distinctly wry wit and bridges the gap between a teenage Levon Helm sans accent, to Elvin Bishop. For sure, Stroup ably and aptly gives a nod to the Big Man’s tenor sound, lending even more of an Asbury Park impression, further bolstered by Conahan’s roadhouse piano. The rest of the rhythm section provides a relaxed groove - perfectly suited for the changes. 2. Viscounte really nails a cogent band style on Tryna Get Down with his great vocal treatment, the orchestration of multiple keyboards, and the tune’s crafty structure and lyrics. The addition of backing vocals and tenor sax in the final chorus are a nice touch and really bring it on home. Once again, Kennedy and Amentt provide the perfect foundation for Viscounte’s vision. 3. 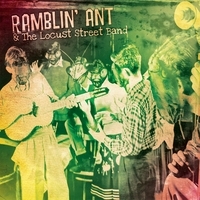 An easy-does-it blues seems a fitting canvas on which to present Ramblin’. Viscounte takes a page from the great blues tradition while seamlessly incorporating his own clever spin on this stalwart form, and allows the band to groove as it sees fit. Gottesman takes a fat sounding ride around the blues with witty commentary by Conahan’s piano. Kennedy ramps up the shout chorus without overdoing it and the quintet brings it on home, nice and easy. 4. Betty Lou is a truly ingenious groove built around a stop-time blues, while channeling a little bit of Phish. Viscounte’s timing and style is right on the money, as the rest of the rhythm section lays it down righteously. When the tune breaks into swing, Conahan lets Sally (Betty Lou?) ride, before the trickster groove comes back. Turn this one up! 5. Can you hear it? The band coming down St Charles? Ain’t Got Nothin’ takes us down to NOLA with authentic hot collective improvisation from Gottesman, Champion and Stroup, crafty breaks, right on the money 2nd Line drums from Kennedy, whoopin’ Sousaphone from Cox and what sounds for all the world like Mardis Gras Indians testifying at the end, courtesy of Goodrich and the Humtones. Viscounte makes a worthy case with this classic melody and updated lyrics while Champion and Gottesman rip it up like they really mean it. No one can sit still while this cut is playing…get on up! Great variety, and some really cool grooves. Listening in the car with roof open, I felt like I was sitting on a deck by a river having a great time soaking in the sounds.